It’s all kinds of strange to be admiring beach shades when cuddled up next to a heater in the chill of winter but Babyologists, there’s something to be said for being prepared when summer rolls around. 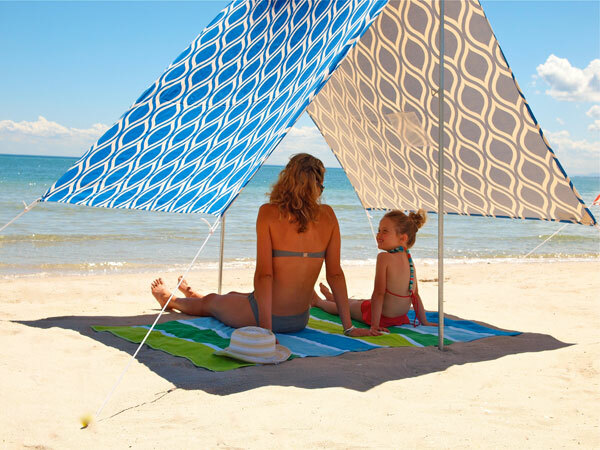 You too can be ready to enjoy yourselves in your shade at the local pool or beach rather than looking longingly at more organised families with their fancy sun protection measures. I love this Sombrilla from Hollie & Harrie, its minimal fuss factor makes it a particularly winning design in my book. It provides shelter from wind and shade from the sun, that’s all you need. No sweeping or shaking out a tent or any of that bother – just simply connect the poles, unravel the ties and peg it down. The kids and I could probably even do it without any assistance from my husband. Three bright and eye catching fabric designs are available – Moroccan blue, French stripe and my favourite, the beach yellow. Each canopy includes two poles, a crossbar and all the ropes and pegs you need. All of this tucks away nicely in a handy bag with shoulder strap. The whole bag when packed weighs only four kilograms, which is fabulous when you consider the boards, bats, balls and buckets you’ll be hauling for a day at the beach with a family. 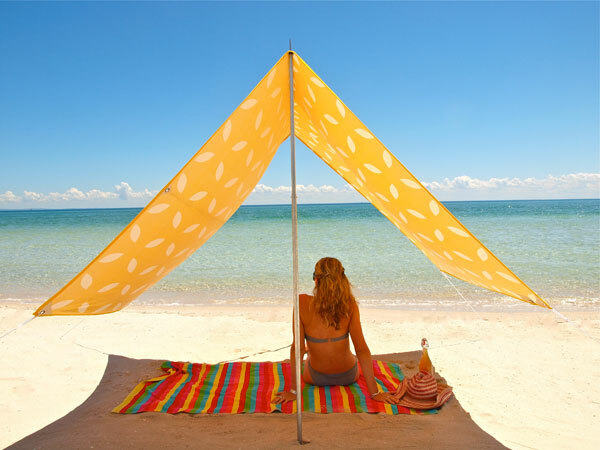 The Sombrilla canopy is made from one hundred percent cotton and gives a hefty ninety-five percent UV protection which is marvellous and so much better than relying just on sunscreen, a tee-shirt and a hat. You can get in early and buy the Sombrilla before that first heat wave arrives for $150 at Hollie & Harrie who deliver Australia-wide.